I had lunch at a restaurant in Hunter's Creek called Bistro Europa Express. This was a restaurant where you ordered at a counter, then you are given a number and the food is delivered to your table. The counter where you order was very appetizing. There were large glass cases displaying all the salads and ready made foods here. Apparently salads are a big thing here where you choose your ingredients following the Subway/Chipotle model. There was a section of the menu specializing in Greek food, and I chose to order from this. I had the Europa Combo, which consisted of gyro, chicken souvlaki, tomatoes, onions, tzaziki, pita, and two sides. This was a humongous amount of food. 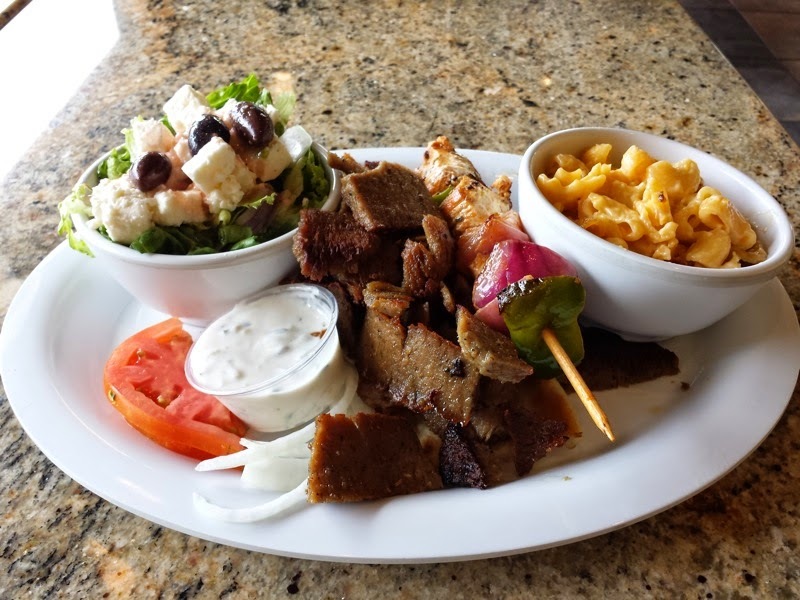 The gyro meat was stacked high atop slices of pita. It had plenty of flavor on its own, but that didn't stop me from dipping it in the tzaziki. 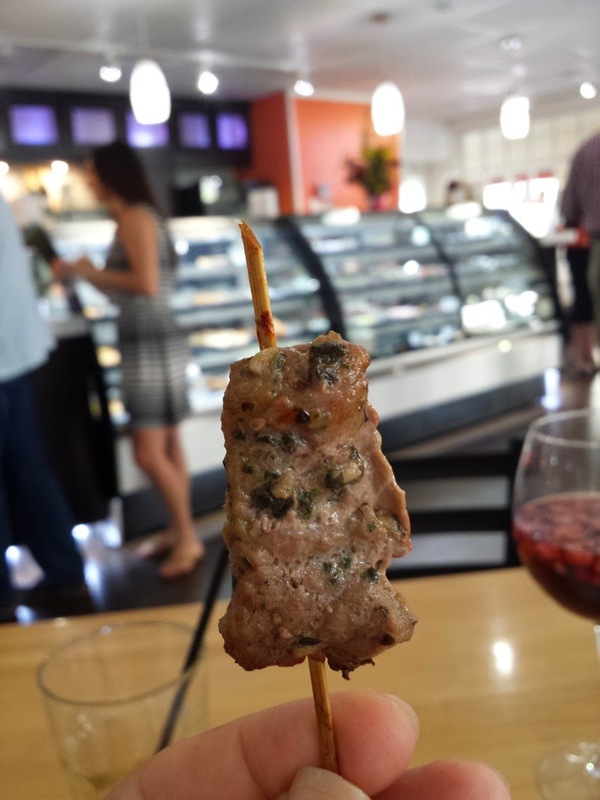 The chicken souvlaki had a few cubes of chicken skewered with onions and bell pepper. For my sides, I had a Greek salad and the macaroni & cheese. The salad consisted of romaine lettuce topped with lots of feta and Kalamata olives. Macaroni and cheese ruined the trend of Greek food, but it called my name when I saw it in the display case. Everything on this plate was very tasty. The price was good for the huge amount of food that was served. I had no complaints about my meal and would return to Bistro Europa Express if I'm looking for food again in Hunter's Creek. We had an appetizer of Ranch Rings. These were onion rings breaded in panko served with a garlic ranch dressing. 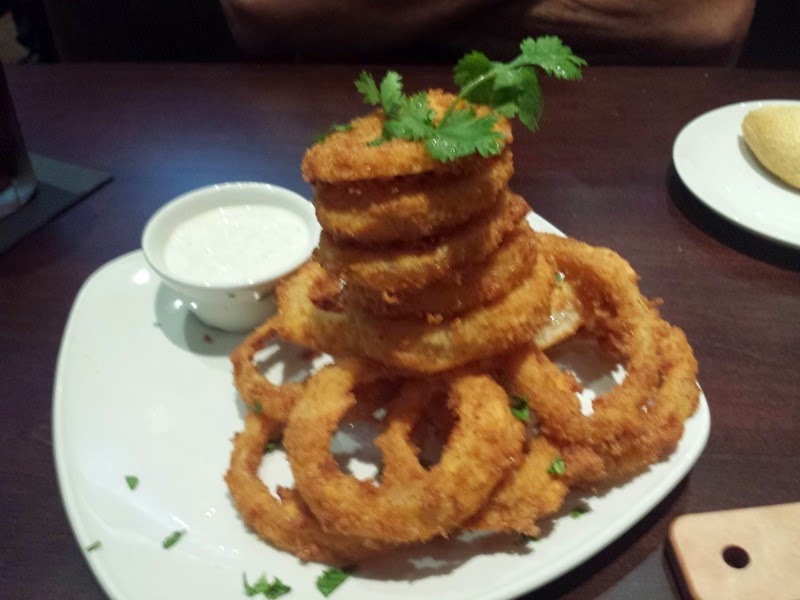 I liked the onion ring structure that was constructed on the plate. I ordered the Salmon Encrusted Salmon as my main course. The fish was topped with mustard aioli, served with Parmesan mashed potatoes and fried spinach. I liked the salmon. The mustard aioli was spicy which was a bit unexpected. Chains seem like they tend to avoid this level of spice, especially when unmarked on the menu. I could see others objecting to the heat, but I liked the spiciness. The fried spinach was also interesting. It was my first time trying crunchy, oil-drenched spinach. It wasn't bad, but I don't think I'd go out of my way to have fried spinach again. My dining companion tried the Filet Mignon. 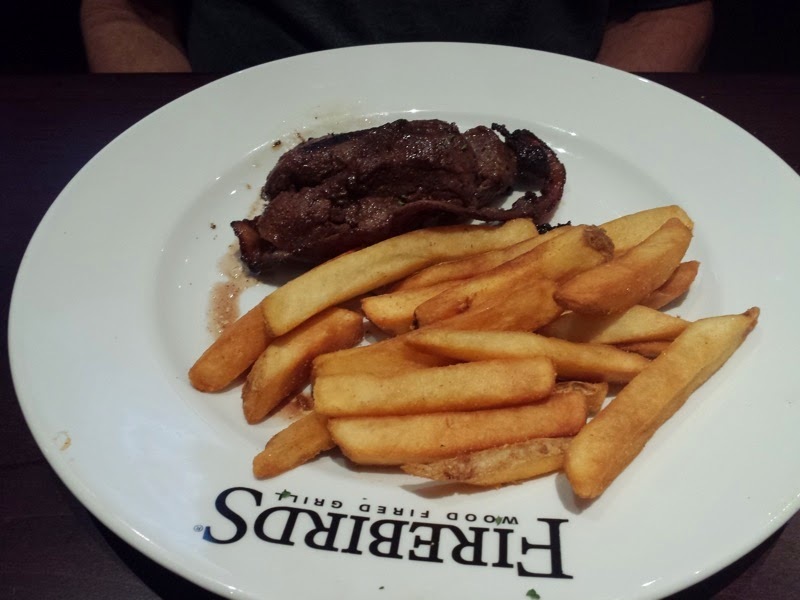 It came wrapped in bacon and was served with steak fries. 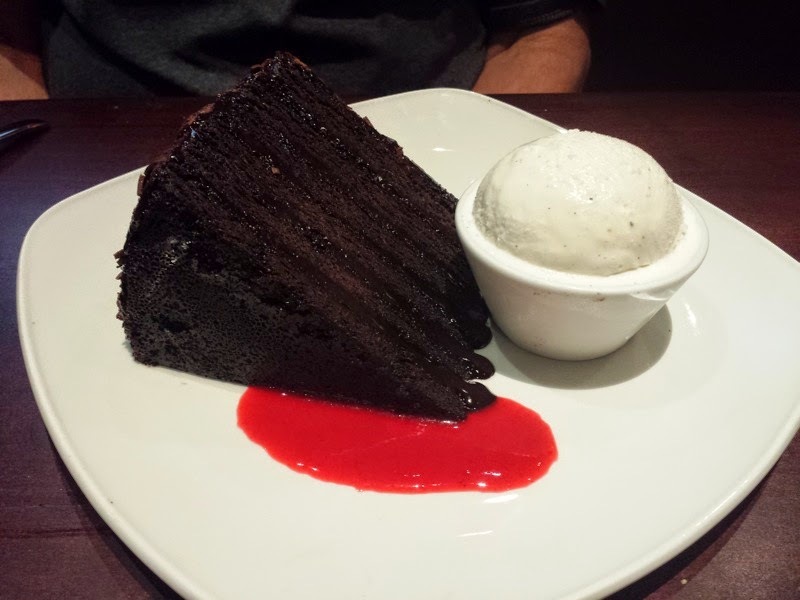 For dessert, we tried the Big Daddy Chocolate Cake. 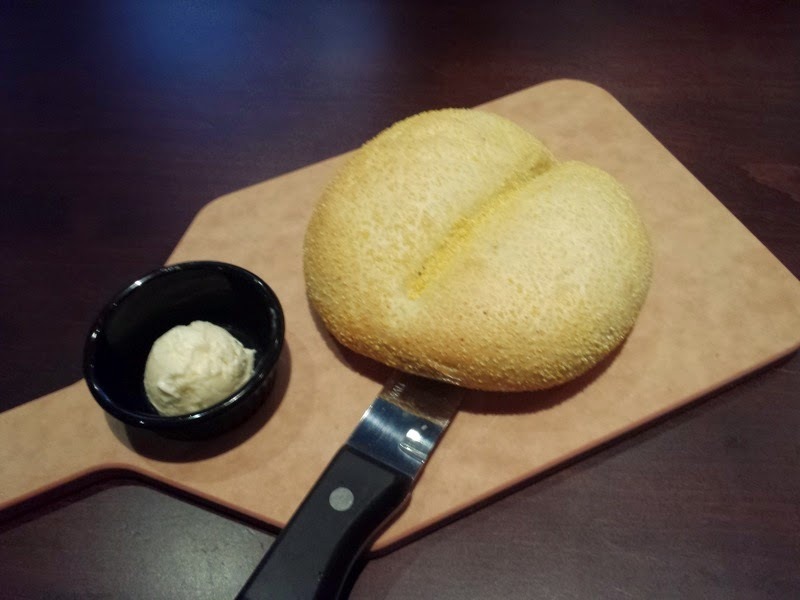 It came with a bowl of vanilla ice cream. 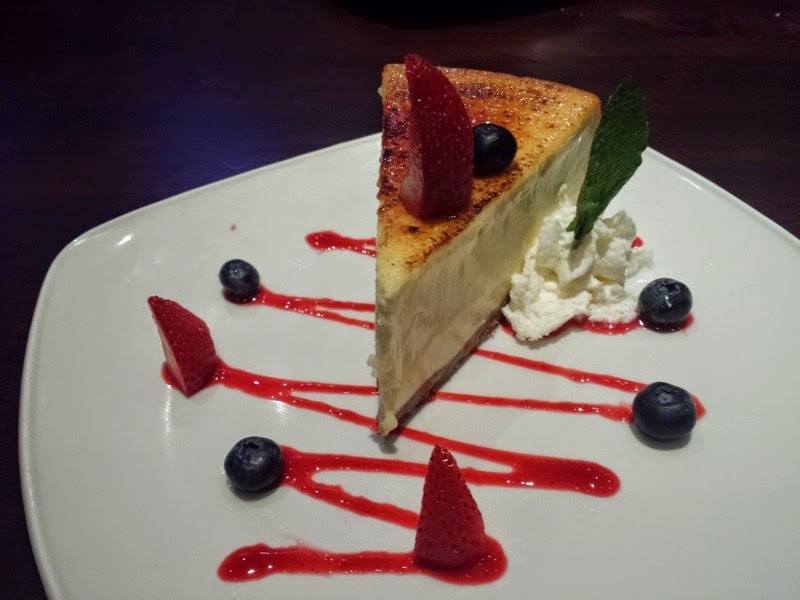 We also tried the Creme Brulée Cheesecake. I preferred this out of the two cakes that were sampled. 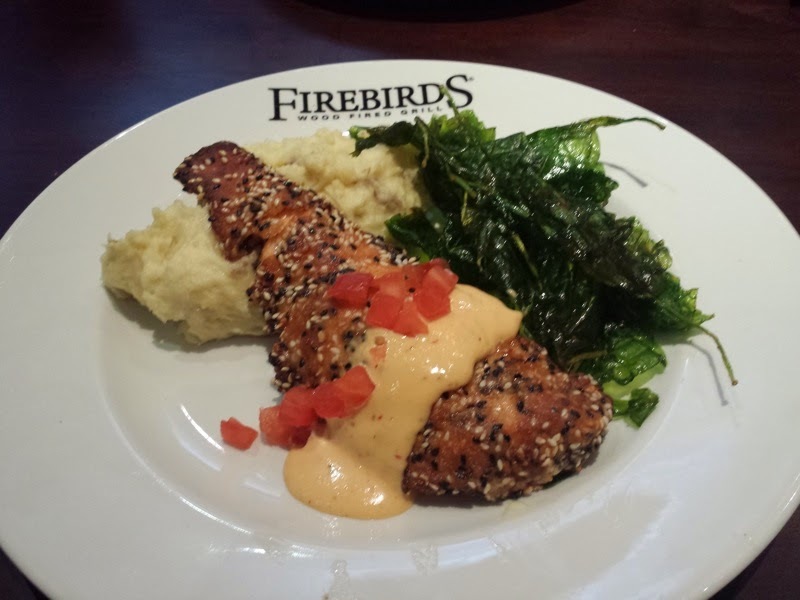 I enjoyed my meal at Firebirds Wood Fired Grill. I can't really give too much of an opinion since everyone working in the restaurant was being trained, but I didn't have any complaints! I was driving home from Tampa and decided it was time for dinner. We got off an exit and ended up driving way too far off I-4 before we found restaurants. 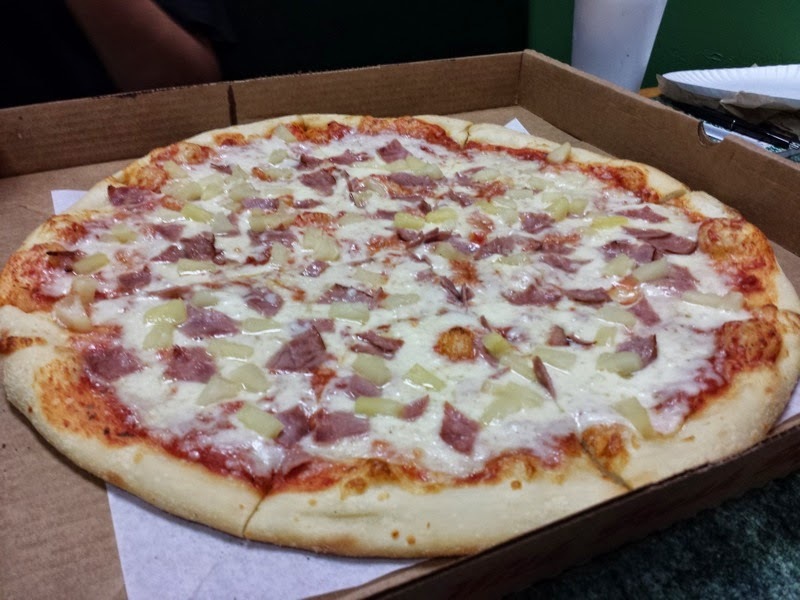 Once we found a Winn-Dixie shopping center, it was decided that dinner would be had at Temple Terrace Pizza. 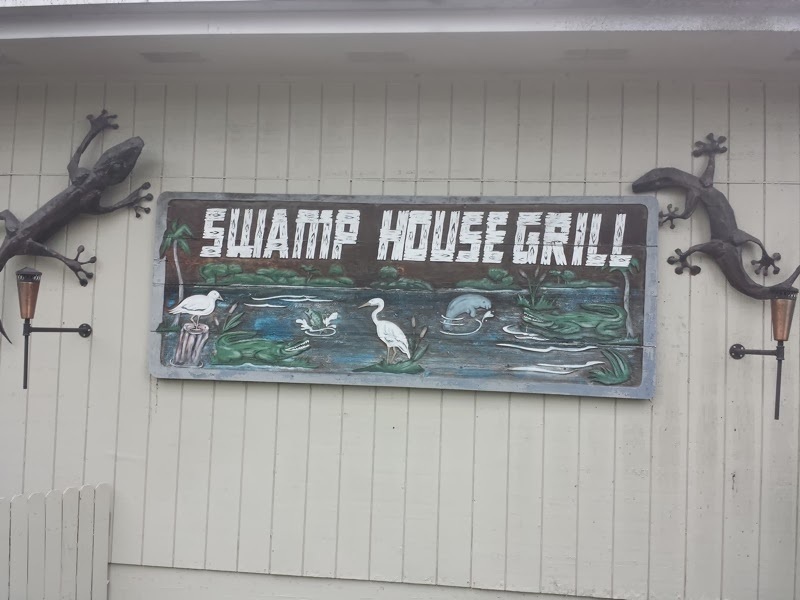 Swamp House Grill is located in the Highbanks Marina in Debary. The restaurant has both indoor and outdoor seating which provide scenic views of the Saint Johns River flowing past. They have a varied menu, serving seafood, steaks, salads, sandwiches, and more. I had their crab cake sandwich on one visit to the Swamp House Grill. This consisted of two crab cakes with lettuce, tomato, and tartar sauce served on baguette style bread. The crab cakes were good and I was able to detect crab in them, unlike some other crab cakes I've had elsewhere where they seem to be all filler. Homemade potato chips were served on the side. I had the grouper ruben on another visit. 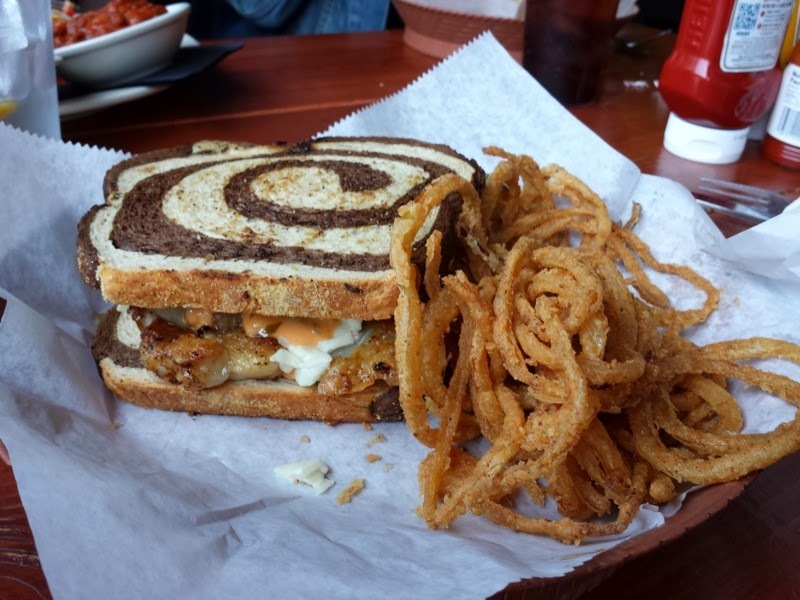 The ruben was served on marbled rye bread, filled with blackened grouper, coleslaw, swiss cheese, and thousand island dressing. This was a very tasty sandwich, although sauerkraut rather than coleslaw seems to be used on most of the rubens I've had in the past. The Swamp House was very generous with the amount of fish on the sandwich as well, which is always a good thing. Fried onion frazzles came as my side. I enjoy Swamp House Grill. The food has been good on every one of my visits. The views of the river are nice. You get to watch alligators swim by as you eat. Certain menu items at the restaurant do seem steeply overpriced for what they are, but otherwise I have few complaints about Swamp House Grill. 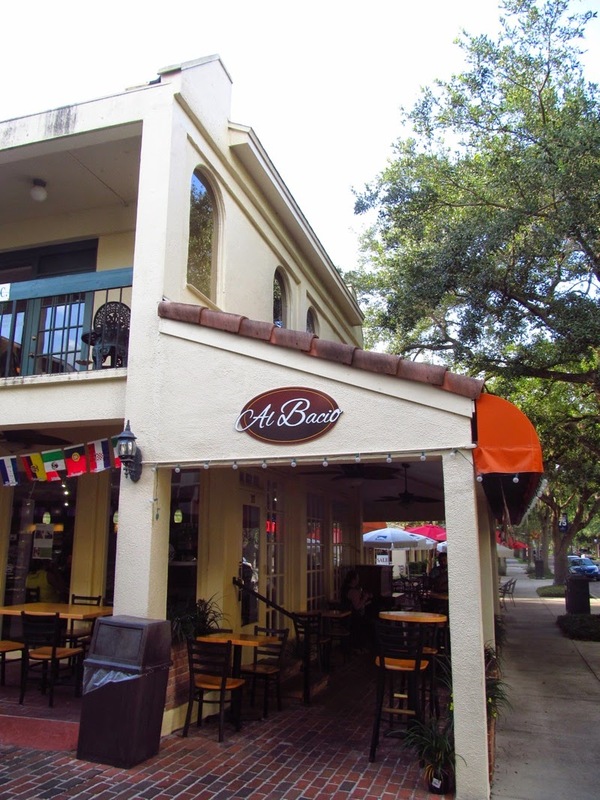 I was recently invited to a new restaurant and bakery in Winter Park called Al Bacio. They are located at 505 N. Park Avenue, very close to the Morse Museum and within walking distance of the SunRail station. When translated to English, Bacio means "to kiss." This should evoke the classic Italian gesture of placing one's index finger and thumb to one's lips and giving a kiss. They serve Italian, American, and Latin American food prepared by world-class pastry and Italian chefs. Al Bacio is open from morning to early evening serving breakfast, lunch, baked goods, coffees and a variety of appetizers complimented by a fine selection of beer and wine. The dessert case is very prominent inside of Al Bacio. It was filled with all sorts of delicious looking pastries including cannoli, cheesecake, fruit tarts, and cupcakes. 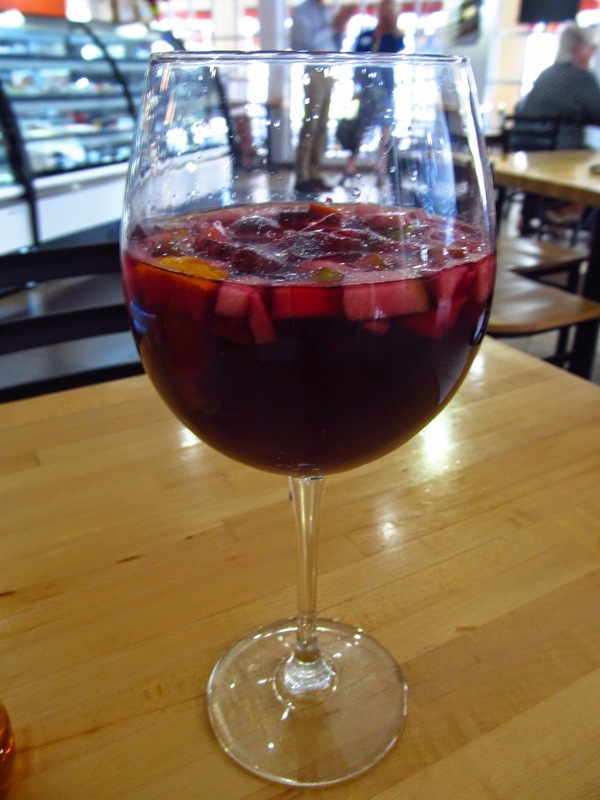 For the media event that I attended, a choice of red or white sangria was offered. We were also served a delicious selection of appetizers, hors d'oeuvres, and pastries. A few days later I decided to go back and show a friend the the coffee shop. I asked if Al Bacio could make coffee drinks with designs in the foam/milk like they have pictured on their website. The waiter told me cappuccino could be made like this, so we ordered two. One of the cappuccinos was served with a nice star design on top made from foam and chocolate syrup. The other was just a plain cappuccino. My friend was a little disappointed his drink was not pretty as well. Cannolis were my favorite dessert at the media dinner. We got another to go with our cappuccinos.